Americans may be consuming fast food wrapped in paper treated with perfluorinated chemicals (PFCs) — the same chemicals used in stain-resistant products, firefighting materials and nonstick cookware, according to a new study published in the journal Environmental Science & Technology. 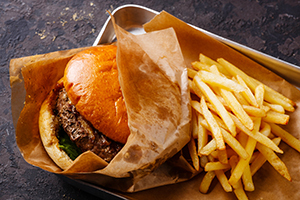 Researchers tested more than 400 samples of packaging materials, including hamburger and sandwich wrappers, pastry bags, beverage cups and French fry containers, and found evidence of fluorinated compounds called per- and polyfluoroalkyl substances (PFASs). Of the materials tested, these chemicals were found in 56 percent of dessert and bread wrappers, 38 percent of sandwich and burger wrappers and 20 percent of paperboard. Previous studies have shown that these PFASs can migrate, contaminating the food and, when consumed, accumulating in the body. Peaslee used a novel specialized method called particle-induced gamma-ray emission (PIGE) spectroscopy, which he developed to analyze the total fluorine content of each piece of packaging. PIGE is an efficient and cost-effective way to measure the presence of chemicals like fluorine in solid samples. Previous studies have linked PFASs to kidney and testicular cancers, thyroid disease, low birth weight and immunotoxicity in children, among other health issues. The chemicals have an especially long half-life and take many years before just 50 percent of the intake leaves the human body. The results are concerning when considering the role of fast food in the American diet. The National Center for Health Statistics reported one-third of U.S. children consume fast food daily. Samples were collected from a total of 27 fast food restaurant chains including McDonald’s, Burger King, Chipotle, Starbucks, Jimmy Johns, Panera and Chick-Fil-A, in and around Boston, San Francisco, Seattle, Washington, D.C., and Grand Rapids, Michigan. The study did not include takeout containers, such as Chinese food boxes or pizza boxes. Upon the results of the study, researchers reached out to each of the fast food chains that had been sampled to see if they were aware the packaging being used contained fluorinated chemicals. Only two responded, each stating they believed their packaging was free of PFASs — one went so far as to state they had received verification from their supplier. But the study showed both respondents had tested positive for a substantial amount of fluorinated chemicals, leading researchers to believe that some chains may be unaware of what’s in their packaging. Peaslee conducted his research as a professor at Hope College. Since joining the University of Notre Dame, he is leading installation of a facility in the Nuclear Science Laboratory at the University to perform PIGE tests routinely on consumer products and environmental samples in the future. Co-authors include researchers and scientists from the Silent Spring Institute, the California Department of Toxic Substances Control, the Green Science Policy Institute, the Environmental Working Group, the U.S. Environmental Protection Agency and the Oak Ridge Institute for Science and Education, as well as the University of California at Berkeley and Hope College.